Happy Meal and I intended to check out The Big Burger in Carson earlier in the day, after visiting the Aquarium of the Pacific, but I couldn't find the place. Happy Meal and I ended up at Jack In The Box-- it didn't warrant a real review. Besides, I noted that Patty Wagon was going to be on the West Side of Los Angeles that evening, so all was not lost. 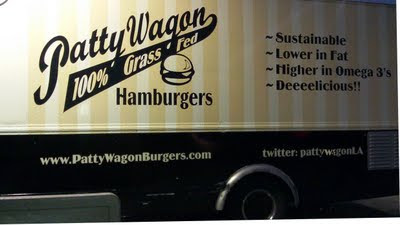 This from the Patty Wagon site "...We are passionate about providing healthy, sustainable, delicious and flavorful beef. All of our animals are exclusively pasture raised in Teton Valley, Idaho. Unlike animals raised in factory farms, our cattle are never fed grain or anything else unnatural to their diet. They are never given any steroids, growth hormones or antibiotics. Our cattle live naturally, on green pastures, which means we are able to provide beef that tastes the way nature intended!..." A few days ago, the LA Food Editor of Urban Dig (Danielle Lehman), asked me if there was a way to generally tell if a burger was going to be mediocre. I shared my discovery that if the staff was clueless about the burger, then that lack of communication within the organization often translated into weak chow. My point being, I was unable to learn anything about the beef in the burgers at the Patty Wagon truck other than the fact that it was from ground up, grass-fed cattle. This lack of pride spilled over into other areas...the chalk menu boards were smudged and, in places, illegible, and other parts of the descriptive signage were missing. 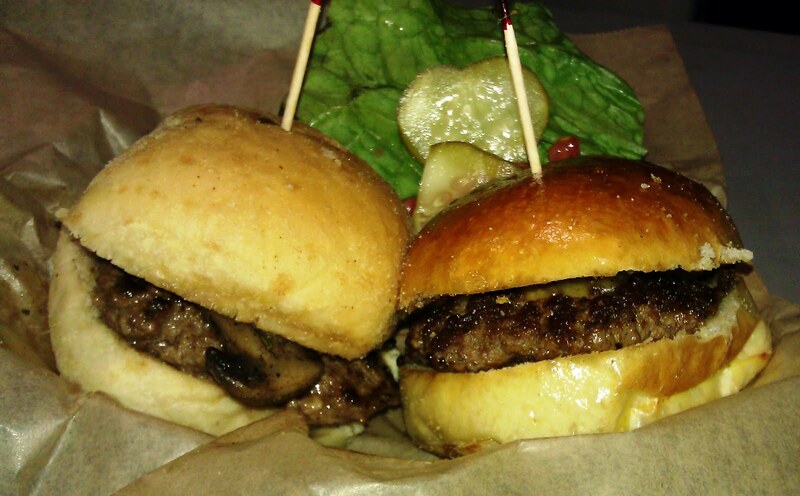 Still, I soldiered on and ordered a couple of the mini burgers--Patty Wagon only sold mini burgers. I ordered a Classic for $2.75 (25 cents extra for a mini slice of Cheddar) and a Mood Indigo ($3.75). An order of fries would have been an additonal $3.50--I was not interested in pushing my total past the 10 buck mark considering that the patties were about 2 ounces each. I am not a $10 quarter pounder guy. My order was up in about 10 minutes. The Beef: Patty Wagon sourced their beef from an unnamed farm in Idaho, and I guessed that this may have also been one of the farms in the expanding Niman Ranch network. Still the cattle were raised in the shadow of the Tetons. "Teton" means "breast", and those are generally a source of goodness and happiness. The beef arrived coarsely pre-ground from the source. While the crew at Patty Wagon was unable to name the cut of beef in the burgers, I was leaning toward Sirloin, and I pegged the fat content at around 12%. The burger patty was pretty strongly beefy. It carried a hefty note of funk--this was a little too strong for the 2 1/4 ounce patty. That funk stuck with me overly long on the ride home. The mouth feel was firm and dry like over-cooked steak. Finally, there was a strong minerality to the bite, which was characteristic of Sirloin. The Classic burger patty was dry...really dry, and that was unfortunate, because the flavor was there. I also tried the Mood Indigo mini burger. The menu was confusing, since it indicated that I was to expect a "mini hamburger with blue cheese, Niman Ranch bacon, sauteed mushrooms and onions served on a toasted ciabatta." All of those typos were a faithful transcription of the Patty Wagon menu. Anyway, my Mood Indigo was lacking bacon, and a conversation with the crew revealed that they had pre-cooked the bacon and had mixed that into the beef. I certainly couldn't taste the bacon, but the Mood Indigo burger patty was much moister and a little more savory. It also lacked the steak-like character of the Classic. The Seasoning: I tasted a faint trace of salt on the exterior of my mini burgers. The Sear: The diminutive patties received a lackluster sear. While, it would have been possible to get a good sear on a small patty, it would have also required very high temperatures. That would have caused the cramped food truck kitchen to be uncomfortably hot. The Preparation: The patties were prepped in the morning. The small burgers were hand-formed with sufficient pressure to keep them together, but they were not over-manipulated to the point of chewiness. The thin, flat burgers were cooked to an indisputable Well Done. 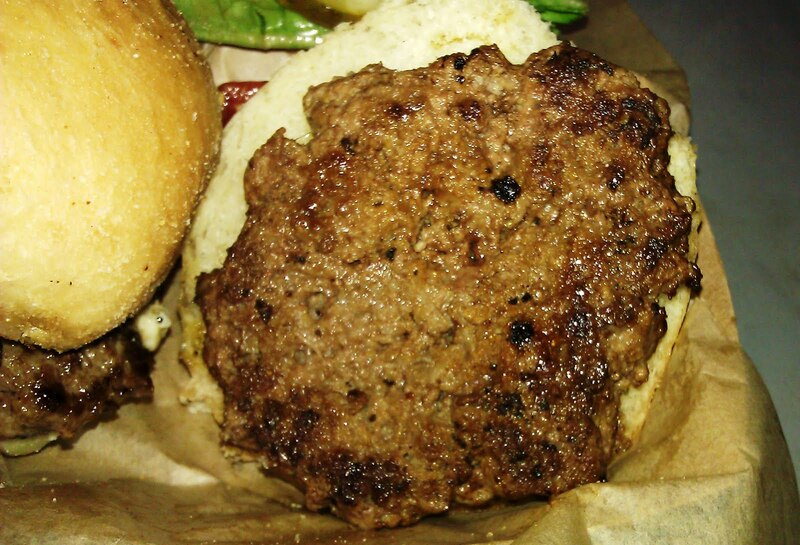 The burgers were cooked on a moderately hot, gas-fired, flat top. The Cheese: Both the Cheddar and the Bleu were mild and only moderately savory. Neither cheese contributed to the dishes in a meaningful way. The Bun: The tiny brioche, which bore the Classic burger was typically sweet and on the dry side. The top was brushed with oil, and that was bothersome. Ladies and Gentlemen--the point of the bun is to keep the grease off of one's fingers. If I wanted greasy fingers, I would have ordered a bunless burger....so it goes. The ciabiatta that sandwiched the Mood Indigo burger was terrific. It had all of the pillowy, moist, neutral goodness of a fresh potato roll. Neither bun was properly toasted, so neither bun delivered a much-needed crispness to the bite. The Toppings: The tomato slice was pornographically moist and red--it was delicious. Sadly, the Romaine lettuce leaf was a little black and rotten around the edges. I requested a fresh leaf, and it took quite a long time to locate a suitable one. I assumed that Patty Wagon had taken delivery of a bunch of bad Romaine, and they were sorting through the stock to find a suitable piece. Accordingly, I did not taste the Romaine lettuce. The sautéed onions and mushrooms on the Mood Indigo were savory and well-prepared. These toppings conferred some much-welcomed moisture to the bite. The Fries: I did not order fries, but other folks around me did. The fries were ribbon-cut. This meant that the flat fries came out very crisp. They were salted with sea salt after being cooked to a deep golden brown. The Value: I spent $6.75 on a couple of 2 ounce cheeseburgers of nominal quality. I did leave full. The value was about average at Patty Wagon. The schtick at Patty Wagon was mini burgers. Mini burgers tend to be dry. Patty Wagon's mini burgers followed that trend. Patty Wagon served up burgers that were close to being good, but quality control issues and some over-cooking took these burgers from pretty good to merely OK.
Burger Review : The Patty Wagon truck used some exceptional beef in their mini burgers. If the management were to educate the staff regarding the ingredients, there might be some additional pride in the preparation.